A circadian rhythm is an approximate daily periodicity, a roughly-24-hour cycle in the biochemical, physiological or behavioural processes of living beings;it is are endogenously generated, and can be entrained by external cues . Perhaps the most obvious function regulated by circadian rhythms is the daily sleep and wake cycle in animals. However, many other physiological processes are regulated by circadian rhythms, including body temperature, feeding behaviour, hormone secretion, drug and xenobiotic metabolism, glucose homeostasis, and cell-cycle progression. The rhythm persists in constant conditions (for example, constant dark) with a period of about 24 hours. The rhythm is temperature-compensated, i.e. it maintains the same period over a range of temperatures. The rhythm can be reset by exposure to an external stimulus. When circadian cycles are disrupted, either by genetic or environmental insults, disorders of diverse physiological processes can occur. In addition, in modern societies, humans are increasingly ignoring natural circadian cues, so it is important to understand how the resulting perturbations of our circadian biology might affect our physiology and susceptibility to disease — both to understand the disease processes and to identify new targets for treatment. The ability of living systems to sustain approximately 24-hour rhythms in the absence of environmental cues shows that most daily oscillations are not responses to the diurnal cycle, but rather are generated by an internal clock. Expression of endogenous circadian rhythm when subjects are isolated from external cues, such as the light cycle, is described as free running. The difference in the level between peak and trough values of the rhythm is referred to as the amplitude (for example, the amount of activity or the level of circadian gene expression either in mRNA or protein levels). When individual genes involved in circadian rhythms are disrupted in mice, changes in free-running period, phase or amplitude of rhythms can be observed. The primary environmental synchronizer of circadian rhythms in mammals is the daily light–dark cycle. These factors are likely to include proteins such as transforming growth factor α (TGFα), cardiotrophin-like cytokine and prokineticin 2. The circadian clock mechanism involves a cellautonomous transcription–translation feedback loop comprised of a core set of genes that are highly conserved among animals. During the day, the basic helix-loop-helix PAS-domain containing transcription factor CLoCK (or NPAS2) interact with bmAL1 to activate transcription of the Per and Cry genes, resulting in high levels of these transcripts. The resulting PeR and CRY proteins heterodimerize, translocate to the nucleus and interact with the CLoCK–bmAL1 complex to inhibit their own transcription. During the night, the PeR–CRY repressor complex is degraded, and CLoCK–bmAL1 can then activate a new cycle of transcription. The entire cycle takes approximately 24 hours to complete. In addition to the primary feedback loop, there is a second negative-feedback loop involving the nuclear hormone receptor Rev-erba, which is a direct target of CLoCK–bmAL1 and which strongly represses Bmal1 transcription. Finally, there are a number of other candidate clock components such as Timeless, Dec1, Dec2 and E4bp4 , the roles of which have not yet been clearly defined. Mammalian PeR1 and PeR2 proteins are progressively phosphorylated as they accumulate during the late afternoon and night. Key kinases involved in PeR and CRY phosphorylation are casein kinase 1 delta (CSNK1D) and CSNK1e. One of the roles for phosphorylation of clock proteins is to target them for polyubiquitylation and degradation by the 26S proteosomal pathway. Recent work has shown that circadian transcription of CLoCK–bmAL1 target genes is accompanied by circadian changes in histone H3 acetylation and chromatin remodelling. The histone deacetylase sirtuin 1 (SIRT1) interacts with CLoCK and can deacetylate lysine 537 of bmAL1 as well as lysine 9 and 14 of histone H3. SIRT1 is expressed in a circadian manner and regulates circadian gene expression of Bmal1, RAR-related orphan receptor gamma (Rorc), Per2 and Cry1 through interaction with CLoCK–bmAL1 and through deacetylation and degradation of PeR2. Because SIRT1 is an NAD+-dependent histone deacetylase, it will be interesting to see if this pathway provides a link between cellular metabolism and the circadian clock. Given the molecular insights of the circadian clock mechanism from model organisms, an obvious question concerns the conservation and possible role of clock genes in human biology. Perhaps the most obvious circadian rhythm in humans is the daily pattern of sleep and wakefulness. According to the well accepted model of sleep regulation, the timing of sleep and wakefulness is controlled by two processes: a sleep homeostatic process that underlies the rise of sleep propensity during wakefulness and its dissipation during sleep, and a circadian process that determines the thresholds for switching between sleep and wake. Among the human sleep disorders, a subset of insomnias has been clearly linked to circadian alterations in the timing of sleep. These sleep disorders are known as advanced sleep phase syndrome, delayed sleep phase syndrome (DSPS), non-24-hour sleep–wake syndrome and irregular sleep–wake pattern. To date, there is one clearly established mendelian circadian rhythm disorder in humans, known as familial advanced sleepphase syndrome (FASPS). FASPS is inherited in an autosomal dominant fashion and is characterized by persistent 3–4-hour advanced sleep onsets and awakening times relative to conventional and desired times. Thus, FASPS is thought to result from an abnormal phase position of the circadian cycle relative to the desired sleep–wake schedule. Using linkage analysis, Toh and colleagues found that the missense mutation S662G in human eR2 cosegregated with FASPS38. Interestingly, the S662G mutation occurs in a phosphorylation site within a CSNK1-binding domain of PeR2. Independent work by vanselow and colleagues suggests that the turnover of PeR2 is not significantly affected by the S662G mutation,and that the FASPS mutation actually reduces the nuclear retention of PeR2. Thus, the molecular basis of this form of FASPS seems to be caused by an increased turnover of nuclear PeR2, either by enhanced degradation or by reduced nuclear retention of PeR. Several independent studies of FASPS have failed to identify mutations in PER2. Consistent with these observations, Xu and colleagues have identified a mutation in CSNK1D, a paralogue of CSNK1e, in FASPS using candidate gene approaches. It will be of great interest to see whether additional mutations in core clock genes will be found to underlie the additional cases of FASPS. The fact that the first two cases of FASPS are caused by mutations in core circadian clock genes is remarkable and strongly suggests that the clock mechanism of humans is highly conserved with that observed in rodent animal models. Delayed sleep phase syndrome and circadian rhythm disorders with a complex genetic basis. In humans, DSPS is the most common circadian rhythm sleep disorder in the general population. It is characterized by a chronic inability to fall asleep or awaken at the desired ‘normal’ times of day; the average onset of sleep in individuals with DSPS occurs in the early morning (3 am to 6 am) and their usual rise time occurs in the late morning to early afternoon (11 am to 2 pm). Although they are rare, familial cases of DSPS have been described, suggesting that mendelian inheritance of DSPS might exist. Several association studies of DSPS with sequence variants of known circadian genes have been reported. 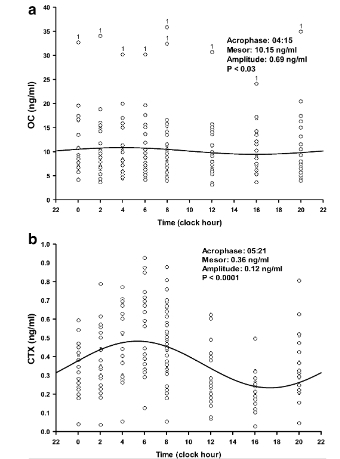 Both significant association and lack of association with the T3111C polymorphism in the 3′uTR of CLOCK have been reported for DSPS and for diurnal preference. One study reported that the amino-acid substitution S408N in the CSNK1E gene, which is in a putative phosphoacceptor site, might have a protective role in the development of DSPS as well as non-24-hour sleep–wake syndrome (in which loss of circadian regulation of sleep occurs). A SNP in the 5′-uTR of PeR2 has also been reported to be associated with morning preferences. One of the more interesting sequence variants is a variable-number tandem-repeat (vNTR) polymorphism in the PER3 gene, which encodes 18 amino acids repeating either four times (PeR3-4 allele) or five times (PeR3-5 allele). The shorter vNTR allele has been shown to occur with higher frequency in a study of 48 Japanese patients with DSPS51. The PeR3 vNTR polymorphism might also contribute to sleep homeostasis; differences in sleep–wake structure, sleep propensity and cognitive performance during sleep loss were noted between individuals who are homozygous for the shorter or longer allele in the general population. Given the interdependent relationships between the circadian and sleep systems, it will be important in future work to determine whether sleep and circadian phenotypes can be clearly distinguished at the genetic level. Perhaps the only known genes that are definitively associated with sleep independent of the circadian system thus far are those genes causing narcolepsy, in which the loss of hypocretin (orexin) ligand or hypocretin (orexin) receptor 2 cause a defect in sleep-stage entry into rapid eye movement (Rem) sleep. 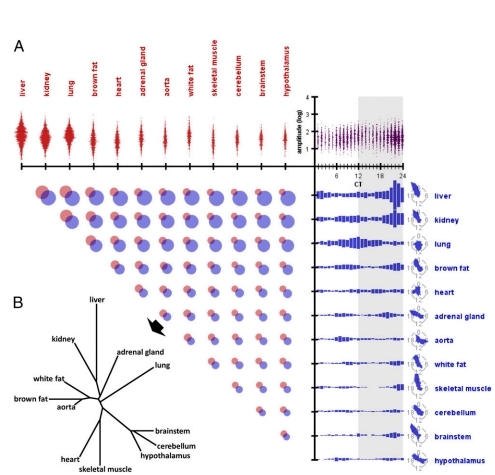 To characterize the role of the circadian clock in mouse physiology and behavior, we used RNA-seq and DNA arrays to quantify the transcriptomes of 12 mouse organs over time. We found 43% of all protein coding genes showed circadian rhythms in transcription somewhere in the body, largely in an organ-specific manner. In most organs, we noticed the expression of many oscillating genes peaked during transcriptional "rush hours" preceding dawn and dusk. Looking at the genomic landscape of rhythmic genes, we saw that they clustered together, were longer, and had more spliceforms than nonoscillating genes. Systems-level analysis revealed intricate rhythmic orchestration of gene pathways throughout the body. We also found oscillations in the expression of more than 1,000 known and novel noncoding RNAs (ncRNAs). 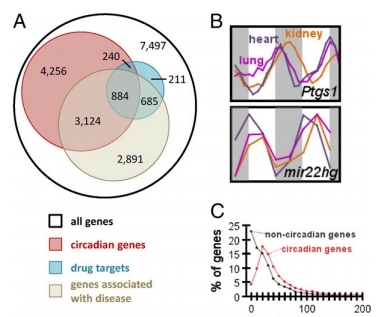 Supporting their potential role in mediating clock function, ncRNAs conserved between mouse and human showed rhythmic expression in similar proportions as protein coding genes. Importantly, we also found that the majority of best-selling drugs and World Health Organization essential medicines directly target the products of rhythmic genes. Many of these drugs have short half-lives and may benefit from timed dosage. In sum, this study highlights critical, systemic, and surprising roles of the mammalian circadian clock and provides a blueprint for advancement in chronotherapy.